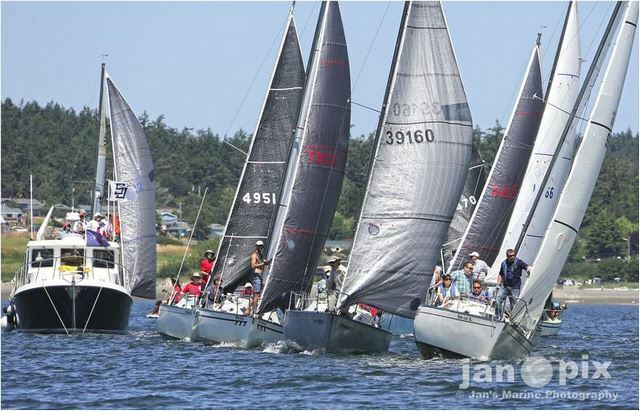 Fifteen San Juan 24s from around the Salish Sea lined up in Penn Cove on July 14th and 15th for the Fleet’s North American Championship but one, Ekono Juan from Orcas Island, dominated the event with 8 bullets in 11 races to claim its third consecutive championship. 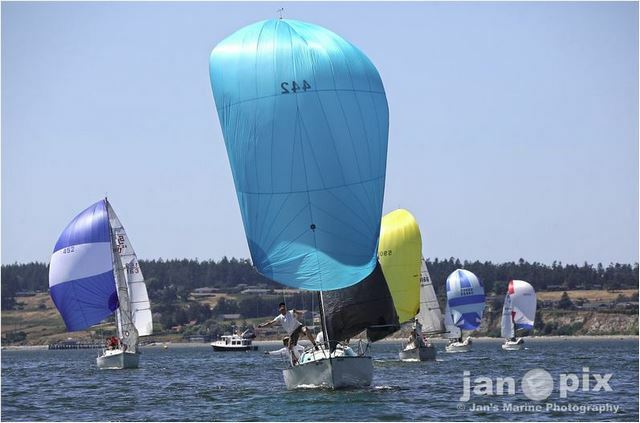 Despite Ekono Juan’s wins, the races were closely matched – six other boats claimed at least one second place, and often the race committee had to closely watch three or four boats crossing the finish line overlapped. One-design racing at its best. Sailing with Ryan Forbes on Ekono Juan were Ian Wareham (helm), Chris Kaufman and Justin Blevins. 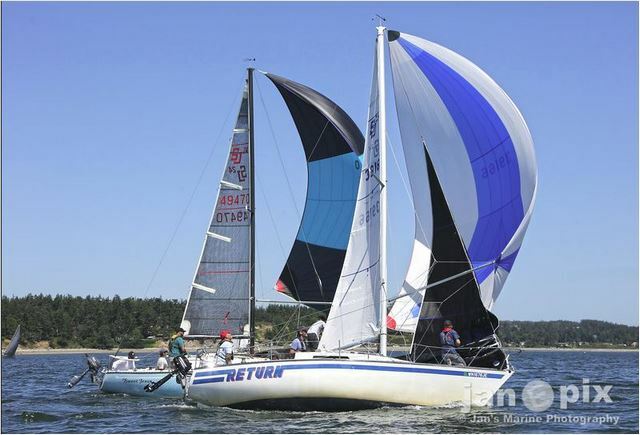 Grauer Geist, skippered by Ken Johnson, finished second for the regatta, with consistent top four finishes in all but one race, followed by Dave Steckman’s Renaissance which finished the second half of the regatta strongly with two firsts, two seconds and two thirds, to claim third. 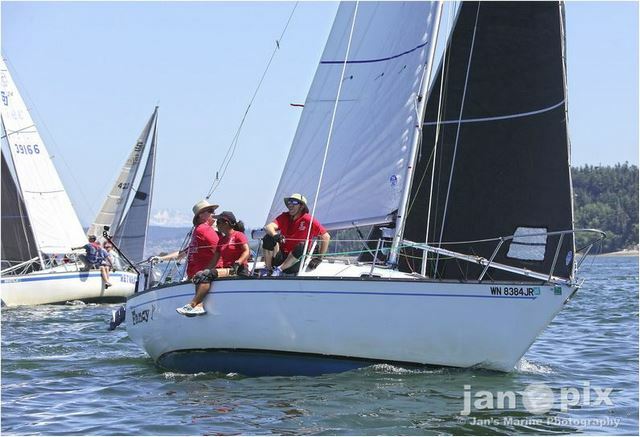 Bruce, from Bellingham and skippered by Mike Kleps, which was 2nd in 2017, was 4th and Mark Bradner’s Return from Seattle, a previous North American champion, followed closely in 5th. 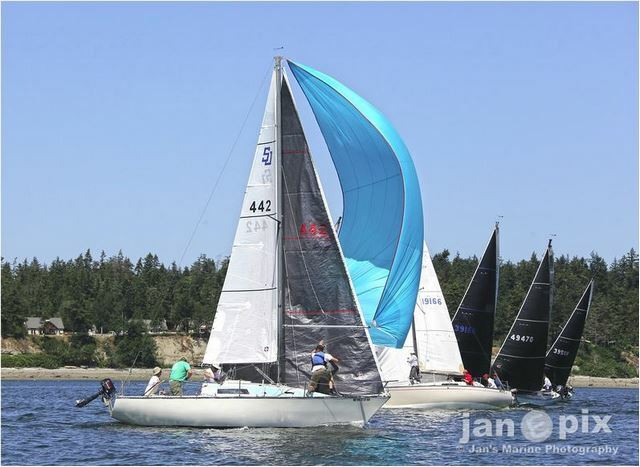 Consistent good starts, sharp upwind tactics and downwind speed proved the difference among the top boats. One challenge for the weekend were the significant tides – the low each day was between 12 noon and 1 pm, a negative two feet, an hour or two into the racing, matched between high tides of over 10 feet – thus the famous (“infamous”?) Penn Cove counter-clockwise current grew increasingly stronger during each afternoon’s racing. 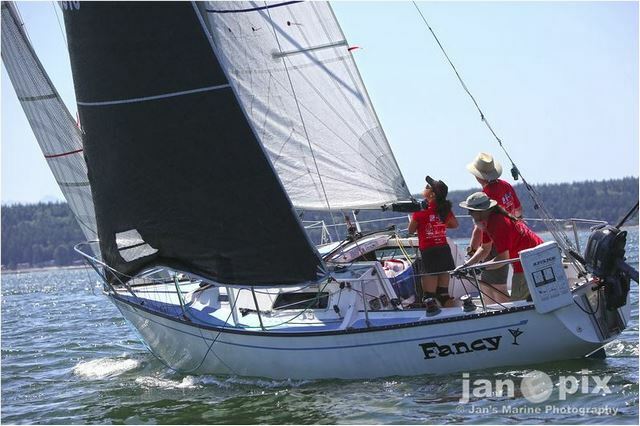 The westerly, with occasionally northerly components, came in just before 11 am on Saturday (the time of the first warning) and delayed racing a bit on Sunday – the early winds were not settled, providing a challenging series of lifts and headers irrespective of what tack one was on. 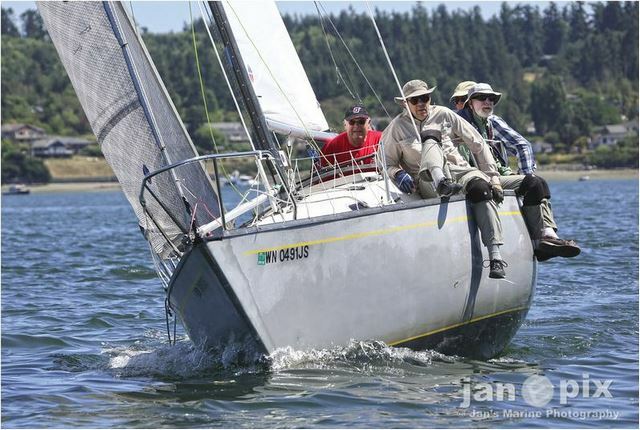 Nevertheless, the Race Committee, heading by Byron Skubi of Oak Harbor as PRO, ran a series of excellent windward-leeward (some short, some long) races, quietly moving the marks between races to adjust for the ever-changing conditions. 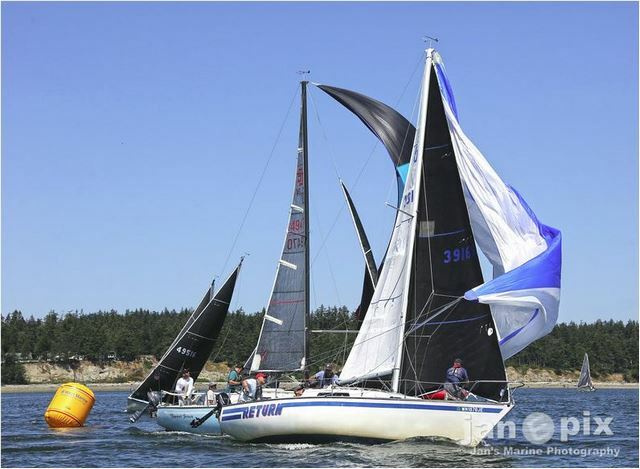 Seven races were run on Saturday, exhausting the Fleet, followed by a more moderate four on Sunday. The second race on Saturday proved a harbinger of the weekend – Grauer Geist had a good lead going around the last weather mark but sailed into a light wind spot before gybing for the downwind finish. Ekono Juan gybed earlier and ran a puff down the course ever-closing on Grauer Geist – just before the finish, with both boats on port, Grauer took Ekono Juan up and up until both boats were almost past the finish line, but Ekono Juan handled the tight reach-to-reach gybe back better to finish a foot or two ahead of Grauer. 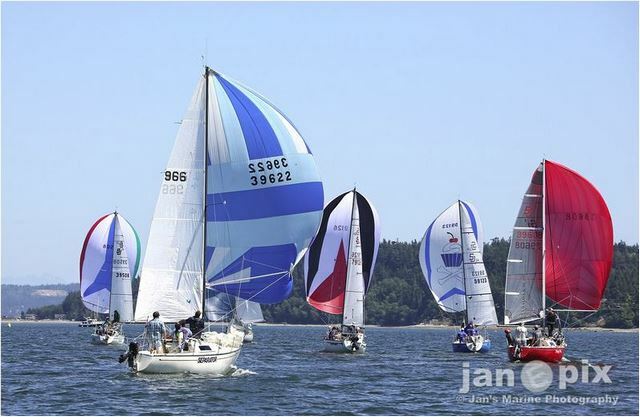 Starts became increasingly tighter, with two general recalls before the fourth race, aided by the ever-stronger up-course current, resulting in the round-the-ends flag being posted to slow down the fleet. The race committee was not so patient on Sunday, and the one (and only) general recall was immediately followed by hoisting the I-Flag. It wasn’t until the fifth race of Saturday, after four firsts, that Ekono Juan had a rare buried start and Dave Steckman’s Renaissance broke through to win handily the race – she rode the south shore current to the east to the deep set leeward marks to build a commanding lead. In the next race Ekono Juan’s no. 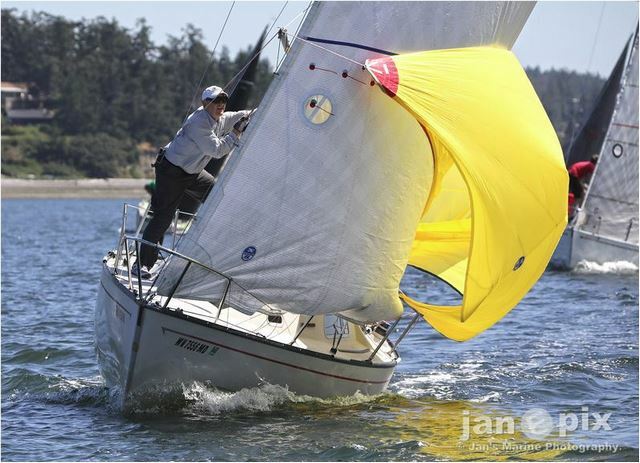 1 jib suffered a big tear after the start and she raced without a head sail for a considerable period while the crew found the no. 2 jib. Grauer claimed its only win of the regatta, with Renaissance and Bruce close behind. Ekono Juan put up its no. 2 sail and of course the wind built a bit for the last race of the day, and she claimed her 5th first place. Going into Sunday’s race, Ekono Juan had a 4 point lead over Grauer, and with its one throw-out used up in last place finish in race six, she had actually little margin for error – one more buried start or bad first leg could give an opening for the trailing boats – but she claimed three firsts in the four Sunday races that overcame a 6th place in the next to last race and was the deserving champion. Jared Hickman chaired the protest committee, aided by Steve Hood from Bellingham and Liesl Mordhordst from Seattle. In addition to PRO Byron Skubi, others on the race committee included Larry Munns, Jane Mays and Avis Berney.